Ben Lowman - Professional Musician & Educator - Discover, Learn & Play. Players of varying standards are welcome at the winter gardens jazz workshop. We'll be learning about improvising, exploring the roles within a jazz group and examine the importance of interaction. Playing with other musicians is vital to jazz music, and you will be encouraged to play throughout the session! The workshop will end with performances from those who are willing to participate. Take the plunge and sign up today! For full details of other fantastic gigs and other great workshops at the festival, please visit here. Please see ZIP file below for parts. #5 Hurricane Connie - Cannonball Adderley. Welcome back! Next week I have a performance coming up playing exclusively Cannonball Adderley repertoire, As a result, I've been back listen to the man himself, specifically the album mentioned in post 2, 'Julian 'Cannonball' Adderley.' 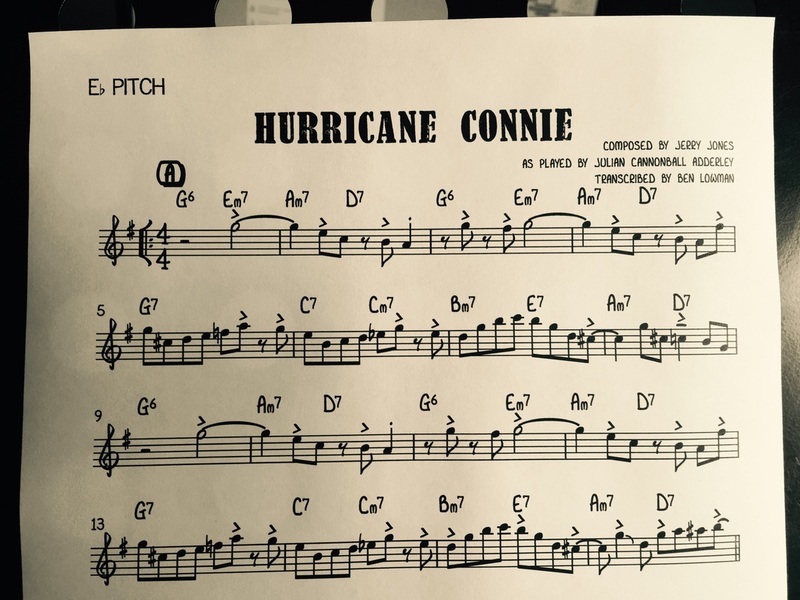 The tune I have gravitated toward this week is called 'Hurricane Connie.' This track isn't on YouTube, similar to 'rose room' though you can buy 12 classic Cannonball albums for £3.49 from iTunes,(follow the link). The 12 classic albums includes the song 'rose room,' among many others - It's thoroughly worth investing in! The tune 'Hurricane Connie,' is based upon a song form & progression called 'rhythm changes.' This is form and chord progression was composed from a song called 'I got rhythm,' in 1930 by George Gershwin. Click the link to see a restored video of him playing from 1931. The amazing thing is that this chord progression and form (AABA) is still be still being used to play and compose over today! A 'rhythm changes' is a very common chord progression and form (AABA), used time and time again to compose melodies over. Over time musicians have composed new 'heads' (jazz terminology for melodies) over this existing form as well as developing the harmony. If you don't understand form like AABA or chord progressions, don't worry, I'll be covering some in upcoming posts! 1. Once you've learnt a rhythm changes chord progression & have practised soloing, you can use jazz language/ patterns, shapes etc for improvising on a number of various songs! Helping to make your improvising skills instantly adaptable to a new song.- hoorah! 2. You are able to play other 'heads,' in your solos whilst playing a different song! This is called 'quoting,' and happens frequently when some jazz musicians improvise. A master of this was Phil Woods. find out more about him on his website. You need to be slightly weary whilst quoting other heads over different rhythm changes chord progressions. This is because sometimes the chord types in the progression vary slightly. This can be enough to make some heads not sound quite right over other rhythm changes progressions. This is the case with parts of 'Hurricane Connie,' but this is something I'll cover in more detail at a later date. My advice would be, If you can, use a combination of theory & your ears to work out/hear if it is going to sound good. If theory isn't a strong point, just use your ears! Ultimately - if it sounds bad or not quite right - don't use that particular head, pick a different one to quote instead! ﻿Here are a few songs which are written over the rhythm changes form. The list goes on - If you know any other heads, it'd be great to know of them, so post them in the comments below! I've included a play-along for practising improvising 'Hurricane Connie.' Again, It's only midi - but still serves it's purpose. You have 3 speeds to choose from, start slow and ensure that you're getting the correct phrasing. Ideally, buy the track and then play along with it slowed down! Anyhow, until next time, keep practising & listening. All the best and catch you soon. This time I've turned my attention to a blues called 'Kelly's Blues,' on the second CD. Oscar Peterson's wife was called Kelly, so I think it would be fair to assume it was written for her! Another interesting little fact, is Oscar Peterson had suffered a stroke in 1993 that weakened his left hand. Despite having a stroke, it didn't stop his desire to continue making music. Within a year of having the stroke, he was back touring and recording. When the recording of 'Kelly's Blues,' was made which I have transcribed, it was post Oscar's stroke but he can very much still play, as you'll see from the transcription..! Album: Live at 'La Salle Pleyel.' June 25th, 1996﻿. 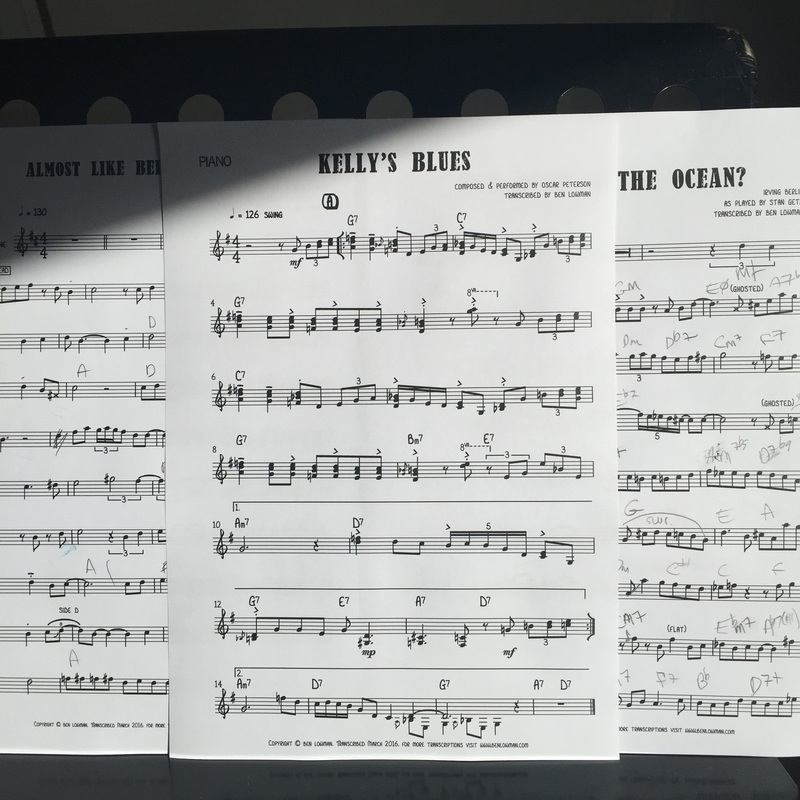 Here are the PDF's for the song 'Kelly's Blues.'' There are copies for concert pitch, Bb and Eb instruments. 1.) If you play a single line instrument, you won't be able to play the harmony lines which Oscar plays alongside the head -, don't let this put you off! It will sound slightly emptier, though It's still a really great blues head to learn - It will definitely benefit your phrasing! 2.) Due to the piano being able to make huge leaps relatively easily, certainly in comparison with say a trumpet or saxophone, you may need to adjust where the notes are by changing octaves. I've done this to a point on the (No Harmony) versions, the other files are untouched, just the transcription with extra notes. Take a look and you'll see what I mean! More phrasing practice. Don't forget phrasing is picked up by repeated listening and playing along with the recording you're learning - so get started now! I strongly suggest buying the CD or even just the track to do this! Below is a MIDI play along for improvising, or playing it without the track! Don't forget - whilst playing, aim to get perfectly in sync with the artist, copying articulation, dynamics & feel. Be as accurate as you can be. What does Oscar have to say? So for this week, thanks for reading. Use the transcription to help you develop your phrasing/ grab some lines, for inspiration, improvising or even just to play on a gig! Hopefully you'll get some enjoyment from playing it and learn something along the way too. P.s. If this is helpful/useful or you have any questions/suggestions/ requests please comment below or even get in touch via my email. #1 Post. 'You look good to me.' - Oscar Peterson. Oscar Peterson is one of my favourite jazz pianists of all time. He was born in Montreal, Canada on August 15, 1925 & sadly passed away in December 2007 at the ripe old age of 82. In his time on the planet he recorded hundreds of 'swinging' albums. When Oscar recorded this album, he was 70 years young & it was post the trio which he'd had with Ray Brown & Ed Thigpen (The combination of Ed, Ray and Oscar produced some of my favorite music of all time, especially the album 'We get requests.' have a listen if you have a moment spare). The younger, and current, me has always loved the virtuosity in Oscars playing, The way in which he plays at speed combining various rhythms, jazz and blues lines in his playing definitely has a resonance with what I enjoy. All of this combined, makes me feel he's able to create melodic and gripping solos which I can, at present, I feel I can only dream of replicating! Anyway, back to the previously mentioned CD. Upon listening through the various tracks, 'You look good to me.' was the one which instantly jumped out. The desire to try and replicate some of Oscars lines on a saxophone was slightly daunting to say the least, but left me inspired. I set about transcribing the parts and learning the head to play at my next gig, as well as documenting the process & making some practice aids - see below. Here are the PDF's for the song 'You look good to me.' There are copies for concert pitch, Bb and Eb instruments. 'You look good to me.' - Bb instrument part. 'You look good to me.' - Eb instrument part. 'You look good to me.' - Concert pitch part. 'You look good to me.' - Rough bass part, concert pitch. Phrasing Practice. One of the most important things which people wish to achieve in jazz is good phrasing and feel. Phrasing is hard to teach, It's picked up mainly by repeated listening and playing along with whichever recording you're learning, Whilst playing, aim to get perfectly in sync with the artist, copying articulation, dynamics & feel. use the YouTube link to practice along with, unless you can find the CD to buy! If you want to be able to slow the piece down, as well as loop the piece It'd be worth you buying this program: Transcribe. Secondly, below are some MIDI backing tracks to help you practice playing the pieces without the artist, as well as a place to experiment with improvising. These again are at 50%, 75% and 100% speed. P.s. If this is helpful/useful or you have any questions/suggestions/ requests please comment below or even get in touch via my email. Good luck!